Thomas Baker has been involved in choral music for many years both as a singer and conductor. He has worked with the Elmer Iseler Festival Singers, the Toronto Mendelssohn Choir and the Vancouver Chamber Choir. For a number of years he also conducted the Pro Arte Singers of Kingston. He also worked as performer-composer with improvisational theatre groups including Co-Opera Theatre and was musical director of Second City in Toronto from 1977-1983. Mr. Baker has been the conductor of the Uxbridge Messiah Singers for many years as well as choir director and organist of Trinity United Church in Uxbridge. He is well known for his involvement with community arts festivals, music theatre and jazz. 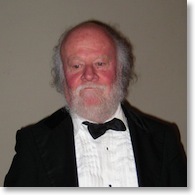 He has composed numerous works, including many choral settings for the Uxbridge Chamber Choir. He has introduced the community to a wide and varied repertoire of choral music, often with professional instrumentalists and chamber orchestras.